I’m a pretty big fan of the combination of chocolate and cinnamon. They compliment each other so well in baked goods and the combination nearly exudes warmth. 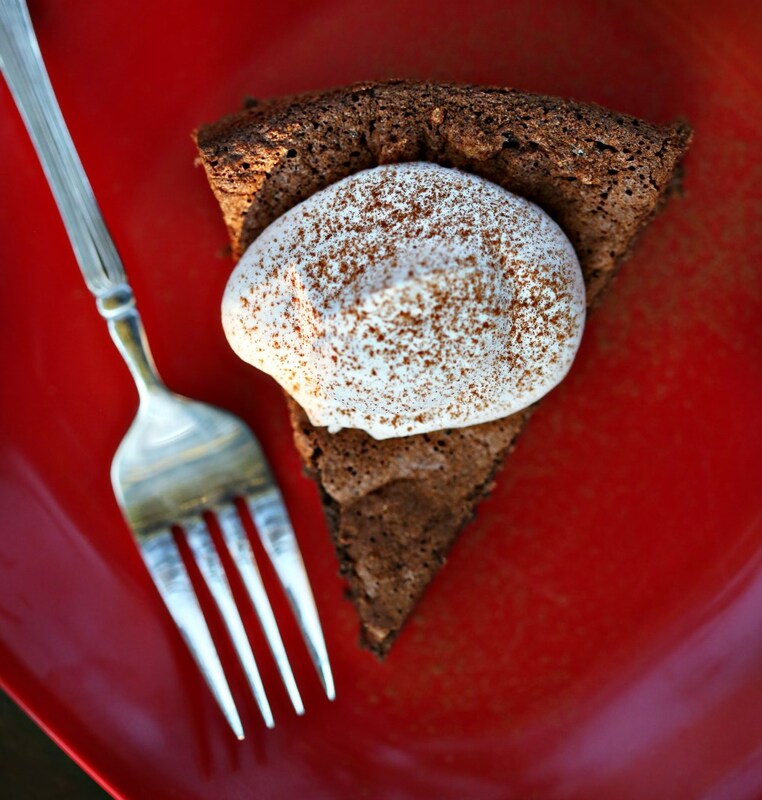 This flourless indulgence boasts the rich flavors of espresso, as well. And if there’s anything the first year of motherhood has taught me, it’s that coffee is from the Good Lord. Chocolate is, as well, but coffee has really become a friend in need this year. Together, they have become our go-to desserts. This cake should be enjoyed with coffee if you are into that kind of supreme happiness. The original recipe doesn’t call for cinnamon, but lately I’ve been adding it to just about everything including the fresh whipped cream I made for this cake. I put more cinnamon than I thought I should and it turned out perfect. And then I sprinkled it with cinnamon. Maybe I have a deficiency? Either way – try this cake. And don’t leave out the whipped cream. It was extra special. Happy weekend and happy baking! Preheat oven to 350 degrees. Butter the sides and bottom of a springform pan. Melt butter and chocolate in a glass or other heat proof bowl in the microwave at 30 second increments until melting and stir together to fully melt and incorporate. Set aside. Beat together egg yolks and 1/2 cup sugar with a mixer on medium-high speed until thick and pale, about 3 minutes. Add espresso powder, 1 tsp cinnamon and salt; beat until combined, about 1 minute. Add vanilla and melted-chocolate mixture; beat about 1 minute more. In another bowl, beat egg whites on medium-high speed until foamy. Increase speed to high; gradually add remaining 1/2 cup sugar, beating until stiff peaks form, about 5 minutes. Fold into chocolate mixture in 3 batches. Transfer batter to pan and bake until set, 40 to 45 minutes. Let cake cool completely in pan on a wire rack. Remove side of pan; transfer cake to a serving plate. Serve whipped cream alongside cake. To make the whipped cream, beat the heavy cream in a mixer on medium-high until soft peaks form. Sprinkle in the cinnamon and whip a little longer, but not too long – you want the cream to stay soft, not get clumpy (which happens from too much whipping.) Serve with coffee and be sure and save some for yourself for breakfast tomorrow! 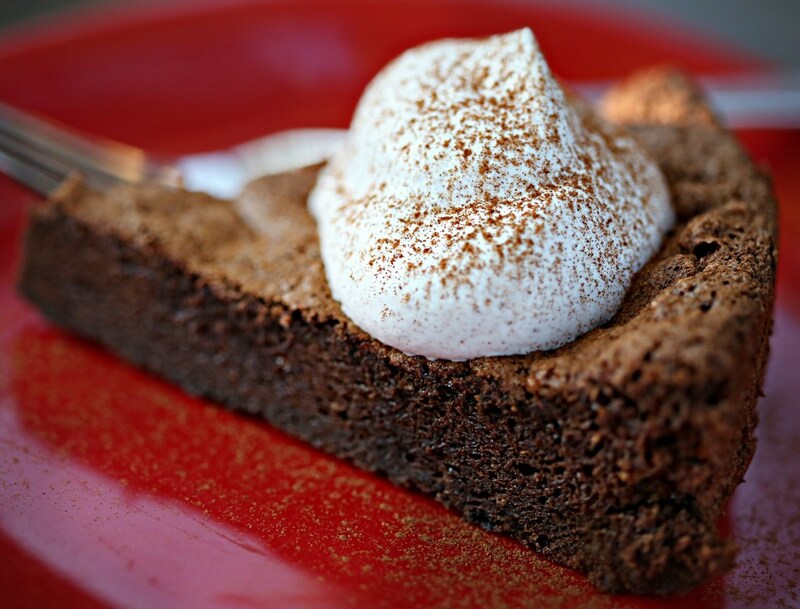 This entry was posted in Baked Goods, Butter, Chocolate, Desserts, Eggs are Awesome, Hearty, Heather, Uncategorized, Weekend Fare and tagged chocolate cake, cinnamon, cinnamon whipped cream, espresso powder, flourless, flourless chocolate cake, gluten-free, whipped cream. Bookmark the permalink.